This is a 6th generation iPod Classic 160GB in Perfect condition. I have even included a picture of the original receipt from 2012. I bought this and never used it because I switched to a smart phone and didn't have the need for an iPod. 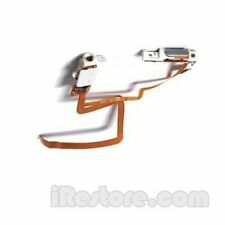 iPod is in Very Good used cosmetic condition with light to normal signs of cosmetic wear. The unit may contain some light scratches/scuffs on the body and other very slight imperfections. Scratches and scuffs marks will be lighter on back of device and on screen. The device does NOT have any cracks or chips in the glass itself (for units with LCD screens). Device is in 100% working condition, fully functional. APPLE Limited warranty has expired. Device is in 100% working condition, fully functional. APPLE Limited warranty has expired. 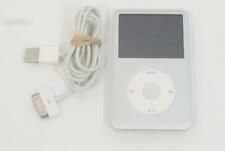 This listing includes the iPod, and generic USB data sync cable. Photos are for generic purposes only and are not the actual device you will receive. Reformatted with a Mac. May not be recognized by Windows 10!. HARD DRIVE.A NICE ONe. APPLE iPOD CLASSIC 6TH GEN. WE STRIVE FOR FIVE. Very good to excellent condition overall, tested and working, front in excellent shape, rear has moderate scratching. This headphone jack is authentic OEM and compatible with all 6th gen & 7th gen models. This headphone jack is also fully compatible with the 30GB 5th gen iPod video as well! As an added bonus, we will also include pre-attached adhesive tape to secure the cable safely to the inside of the iPod's backplate. Th Generation 160GB Black (Model Num MC297LL.). 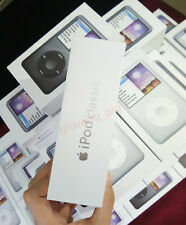 Included in this lot are · 1 IPod Classic 160 GB Black (Model Num MC297LL/7. · 1 Encase Black IPod Classic Protective case W/Belt Clip. 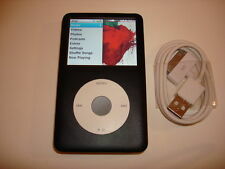 Listed is (1) IPod Classic6. ). Version: A1285 - MB147C. Capacity: 160GB. Type: Ipod 6th Generation. Extras: Belkin hard case, USB cable, ear buds. APPLE IPOD CLASSIC 6th GENERATION MB150LL/A 160GB. GREAT CONDITION. WITH SILICONE SKIN COVER, BOX/MANUAL. WORKS PLENTY OF PICTURES TO VIEW. Apple iPod Classic Video 6th Generation 160gb MP3/MP4 Player. 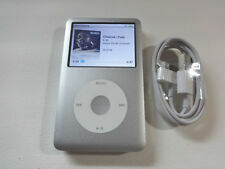 1x Silver iPod Classic 6th Generation 160GB Player(Latest Thick Model). Apple iPod classic puts your entire music and video collection in your pocket with up to 160 GB of storage. Apple iPod Classic Video 6th Generation 160gb MP3/MP4 Player. 1x Silver iPod Classic 6th Generation 160GB Player Latest Model. Apple iPod classic puts your entire music and video collection in your pocket with up to 160 GB of storage. Apple iPod Classic Video 6th Gen (160GB) MP3/MP4 Player Black--90days Warray!!! 1x Black iPod Classic 6th Generation 160GB Player Latest Thick Model. Apple iPod classic puts your entire music and video collection in your pocket with up to 160 GB of storage. 1x USB Cable. Sync with iTunes to download Music&Video! APPLE IPOD CLASSIC 6th GEN MB150LL/A160GB. BLACK Excellent Condition. Excellent Condition. Gently used. No Charger. Operational Condition : Does not power up, dead. This item is being sold for parts. An Apple iPod Classic 6th Gen with 160GB. It powers up when plugged in up to the apple Logo and nothing further there no further testing has been done. It is physically in good condition with minimal scratches and other signs of use. Brand New, Customs Service, 90 Days Warranty!! !